During Fashion Week, there are shows, and then there are events. When Marc Jacobs unveils his new collections -- in the hulking New York Armory, in front of dozens of paparazzi-bait celebrities -- it's an event, maybe the week's biggest. 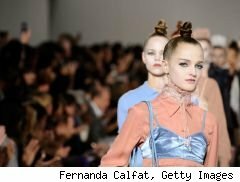 Jacobs showed his Spring 2010 line Monday, and it was clear what's on his mind -- floaty silhouettes in gelato-flavor hues that blossomed and billowed when he sent them down the runways. The critics called it fashion escapism, the equivalent of wearing a frothy movie or a sunny vacation. Well, spring is still a long way off -- but why wait that long to escape? The temperatures may be poised to drop, but that doesn't mean you have to bundle up in dark, drab clothes. Take a cue from Jacobs' ideas and stay warm (and on-budget) with soft pieces in softer shades. Old Navy's wool-blend coats are ideal for the fall-into-winter transition. This taupe jacket, with its ample shawl collar, three-quarter sleeves and ribbed belt, has less stiffness than a pea coat, and it's just as warm. This classic white dress from Merona is fluid but structured -- and it has a universally flattering shape. A great boot for fall is a must -- but don't feel compelled to buy in black or brown only. This pair, from Two Lips, comes in the this-minute over-the-knee style and a gorgeous deep lavender.